Many of the refrigeration appliances used in the home are “frost-free.” The frost-free appliance could more accurately be termed “automatic defrost.” The brain of the frost-free appliance is the defrost timer. 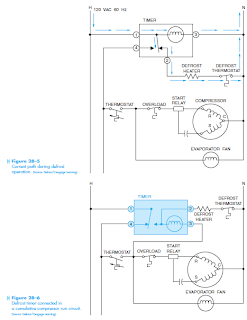 The job of this timer is to disconnect the compressor circuit and connect a resistive heating element located near the evaporator at regular time intervals. The defrost heater is thermostatically controlled and is used to melt any frost formation on the evaporator. The defrost heater is permitted to operate for some length of time before the timer disconnects it from the circuit and permits the compressor to operate again. 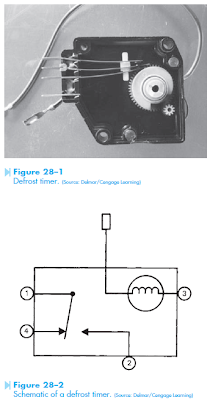 The defrost timer is operated by a single-phase synchronous motor like those used to operate electric wall clocks, Figure 28–1. The contacts are operated by a cam that is gear driven by the clock motor. A schematic drawing of the timer is shown in Figure 28–2. Notice that terminal 1 is connected to the common of a single-pole double-throw switch. Terminals 2 and 4 are connected to stationary contacts of the switch. In the normal operating mode, the switch makes connection between contacts 1 and 4. When the defrost cycle is activated, the contact will change position and make connection between terminals 1 and 2. Terminal 3 is connected to one lead of the motor. The other motor lead is brought outside the case. 1. The continuous run timer. 2. The cumulative compressor run timer. 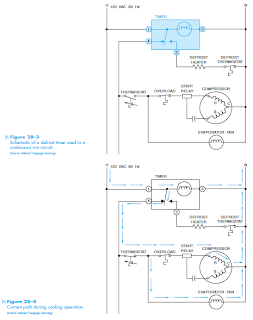 It should be noted that the schematic drawing can be a little misleading. In the schematic shown, the timer contact can only make connection between terminals 1 and 4, or terminals 1 and 2. In actual practice, a common problem with this timer is that the movable contact becomes stuck between terminals 4 and 2. This causes the compressor and defrost heater to operate at the same time. The schematic for the continuous run timer is shown in Figure 28–3. Notice in this circuit that the pigtail lead of the motor has been connected to terminal 1, and that terminal 1 is connected directly to the power source. Terminal 3 is connected directly to the neutral. This places the timer motor directly across the power source, which permits the motor to operate on a continuous basis. 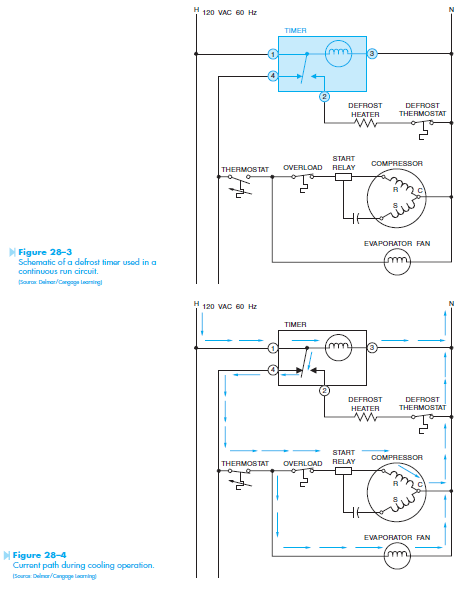 Figure 28–4 shows the operation of the timer in the compressor run cycle. Notice there is a current path through the timer motor and a path through the timer contact to the thermostat. This permits power to be applied to the compressor and evaporator motor when the thermostat closes. Figure 28–5 shows the operation of the circuit when the timer changes the contact and activates the defrost cycle. Notice there is still a complete circuit through the timer motor. When the timer contact changes position, the circuit to the thermostat is open and the circuit to the defrost heater is closed. The heater can now melt any frost accumulation on the evaporator. 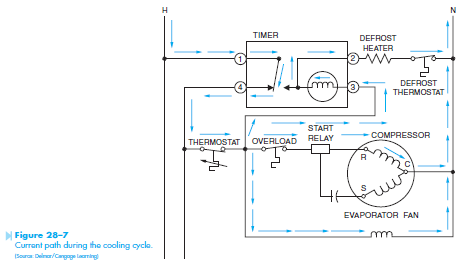 At the end of the defrost cycle, the timer contact returns to its normal position and permits the compressor to be operated by the thermostat. 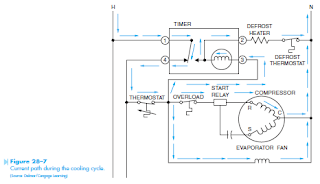 The cumulative compressor run timer circuit gets its name from the fact that the timer motor is permitted to operate only when the compressor is in operation and the thermostat is closed. The schematic for this circuit is shown in Figure 28–6. Notice that the pigtail lead of the clock motor has been connected to terminal 2 instead of terminal 1. 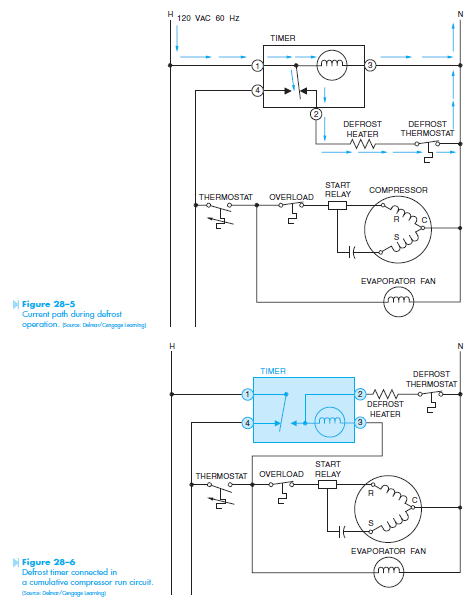 Figure 28–7 shows the current path during compressor operation. The timer contact is making connection between terminals 1 and 4. This permits power to be applied to the thermostat. When the thermostat contact closes, current is permitted to fl ow through the compressor motor, the evaporator fan motor, and the defrost timer motor. In this circuit, the timer motor is connected in series with the defrost heater. The operation of the timer motor is not affected, however, because the impedance of the timer motor is much greater than the resistance of the heater. For this reason almost all the voltage of this circuit is dropped across the timer motor. The impedance of the timer motor also limits the current fl ow through the defrost heater to such an extent that it does not become warm. Figure 28–8 shows the current path through the circuit when the defrost cycle has been activated. Notice in this circuit that the defrost heater is connected directly to the power line. This permits the heater to operate at full power and melt any frost accumulation on the evaporator. There is also a current path through the timer motor and run winding of the compressor motor. In this circuit, the timer motor is connected in series with the run winding of the compressor. As before, the impedance of the timer motor is much greater than the impedance of the run winding of the compressor. This permits almost all the voltage in this circuit to be applied across the timer motor. At the end of the defrost cycle, the timer contact returns to its normal position and the compressor is permitted to operate.